Restorative Treatment - Fillings. Crowns. Bridges. Implants. Tooth colored fillings are a popular treatment for making your smile more beautiful by filling in cracks or covering up gaps. It is commonly used as a cavity filling. This type of bonding can restore stained or discolored teeth to a natural looking color, as well. A dental crown is one of the most common procedures we do in dentistry to restore a tooth’s function. Over the course of time, teeth can begin to weaken. They become prone to dental issues like decay, stains and cracks. And, when a tooth is damaged, it may require a crown to help protect or restore it. We use porcelain (tooth-colored) or gold crowns to cover an entire tooth when it is severely damaged due to decay, fracture or old restorations. Crowns are also used to attach bridges, cover implants, prevent a cracked tooth from becoming worse or protect an existing filling that is in jeopardy of becoming loose or dislocated. Crowns also serve as an aesthetic use and are applied when a discolored or stained tooth needs to be restored to its natural appearance. The process of crown fabrication will take two or three appointments at the office. 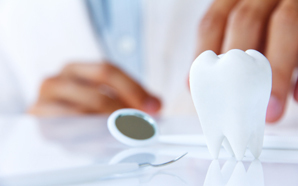 The first step involves filing off some enamel of the damaged tooth in preparation for the crown. Dr. Brown will administer local anesthetic to eliminate your discomfort. Once the preparation is complete, a mold will be made to use for creating the crown. A temporary crown will be made and cemented while the permanent crown is being fabricated. Within two to three weeks, you will be back at the dentist to have the permanent crown fitted and cemented in. With proper home care, crowns should last 8 plus years and they should be cared for as well as your natural teeth. A bridge can be used when a patient is missing one or more teeth. Basically, a bridge is a set of crowns that are connected together and provide the same benefits as a single crown, to give stability and function. A dental bridge works the same way a bridge on a road would. There are two supports, which are the teeth next to the missing tooth. The bridge covers those supporting teeth and replaces the tooth or teeth in between. The missing teeth are replaced and supported to help the patient chew and speak properly. The bridge will help hold the existing, natural teeth in their proper place. Without those missing teeth, your jaw structure will slowly change. Eating and talking may become difficult without tooth replacements. The process in fabrication of a bridge is similar to that of a crown and the number of appointments will vary depending on length and number of missing teeth. People wearing crowns and bridges need to take extra care when eating and cleaning their teeth. It is best to avoid chewing hard and sticky substances, as the crowns or bridges might crack or come off. You also need to properly clean underneath bridges in order to prevent bacteria from forming, which is vital in preventing cavities and decay. Certain behaviors such as jaw clenching or bruxism (teeth grinding) significantly shorten the life of a crown. Moreover, eating brittle foods, ice or hand candy can compromise the adhesion of the crown, or even damage the crown. There are times when a tooth cannot be saved and has to be removed. After the tooth is removed, we often think that is the end to the issues but it’s not. Overtime, the other teeth will start to drift into the space, causing your healthy teeth to become compromised with caries or periodontal disease. The Waukee Dental team has several options to help you restore your bite and one of those options is implants. Traditionally, the best option for replacing a space in your mouth was with a bridge. Bridges work very well and are a nice aesthetic tooth replacement option. But, the problem with a bridge is that it is a 3-tooth replacement option for a single tooth problem. To fabricate a bridge, we have to irreversibly cut down the teeth on either side of the space to retain the bridge. Also, if you have a problem with one of the teeth retaining the bridge, you have to replace the entire bridge. Implants, on the other hand, can conservatively replace the space. Implants are made up of three parts; implant, abutment and crown. The implant is the root-like structure that is placed into the bone. This is allowed to heal for a few months and becomes integrated (osseointegrated) into your bone. Once healed, we attach an abutment that connects to the implant in the bone and a crown is fabricated for tooth replacement. Root canals are tiny passageways that branch off from beneath the top of the tooth, coursing their way vertically downward until they reach the tip of the root. All teeth have between 1 and 4 root canals. Many tooth problems involve infections that spread to the pulp, which is the inner chamber of the tooth containing blood vessels, nerves and other tissues. When the infection becomes worse, it can begin affecting the roots. 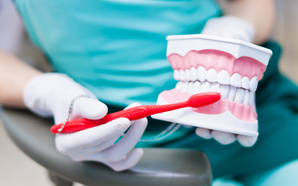 A traumatic injury to a tooth can also compromise the pulp, leading to similar problems. An inner-tooth disease brings a host of problems including pain and sensitivity. A spreading infection can also cause small pockets of pus to develop, which can lead to an abscess. 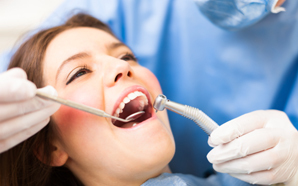 Root canal therapy is a remarkable treatment with a very high rate of success. It involves removing the diseased tissue, halting the spread of infection and restoring the healthy portion of the tooth. In fact, root canal therapy is designed to save a problem tooth; before the procedure was developed and gained acceptance, the only alternative for treating a diseased tooth was extraction. We can perform root canal therapy on anterior teeth and select molar/posterior teeth. Root canal therapy usually entails one to three visits for completion with the final restoration. There are certain situations where your tooth is better restored by a specialist called an Endodontist. Dr. Brown works hand in hand with a number of specialists in the Des Moines Metro area who can handle any difficult situation you might have. With our staff’s advanced technology and experience, root canals aren’t something to be afraid of. And, when combined with our sedation dentistry, they can be a breeze! If you need to have this procedure, schedule an appointment today. Circumstances do present themselves where we find teeth missing. A fact of life is that our teeth age just like we do. However, with modern advances in dentistry we can replace your missing teeth with something that looks and feels great. Nothing is as good as our natural teeth, but Dr. Brown has been trained in making natural-looking dentures that can restore a beautiful smile and replace teeth for speaking and eating. Conventional Full Dentures – All of the patient’s teeth are removed and rhe patient is given a few months for the gum tissue to heal completely. While the tissue is healing, the patient is completely without teeth. Once the gums have healed, the full set of dentures is placed. Immediate Full Dentures – In this situation, the dentist will make measurements and have the set of dentures prepared before removing the patient’s teeth. When the teeth are removed, the dentures are immediately placed. While the patient will enjoy the benefit of not spending anytime without teeth, there will be more follow up visits to make sure that the dentures continue to fit properly. This is necessary because the jaw bone will change slightly in shape as the south and gums heal. Implant Supported Full Denture – Dentures can be secured with implants. With poor fitting conventional dentures, patients are constantly dealing with them moving around while they eat and they can cause sores in your mouth, both of which can decrease your quality of life. The adhesives and pastes only last so long, and then they are right back to moving around. With implant-retained dentures and implant-supported dentures, these issues become a thing of the past. Call us today for a consultation that could not only improve the fit of your dentures but also improve your life. When restoration procedures such as root canal therapy, crowns or fillings are not enough to save a tooth, it may need to be pulled, or extracted. Tooth extraction procedures today are far less painful than ever before, thanks to topical and injectable anesthetics. In many cases, a patient who has a tooth pulled will experience little or no discomfort and only minor bleeding. Dr. Brown and the Waukee Dental staff will go through post-operative procedures, but make sure to avoid smoking, vigorous brushing and brushing. Drinking liquids through a straw is also discouraged during the post-operative healing because they hinder the healing and may cause the wound to open. Cold compresses applied to the outside cheek near the extraction area can help reduce any swelling and promote faster healing. Wisdom teeth are the third and final set of molars that erupt in the back corners of the upper and lower normal adult mouth. Unfortunately, most people experience problems from wisdom teeth. In most cases, this is because the teeth erupt too close to existing permanent teeth, causing crowding, improper bites and other problems. If wisdom teeth are causing a problem, this could mean that they are impacted. Impacted wisdom teeth can be extremely painful, as well as harmful to your oral health. Symptoms are easy to spot; severe discomfort, inflammation and infection. Tooth pain is a certain kind of pain. It is hard to even focus, let alone work or sleep. If you or a family member is suffering from one of these ailments, give us a call right away. The Waukee Dental team will be able to get you comfortable once again. The Waukee Dental Office uses an emergency messaging system after hours so Dr. Brown is always reachable. When you call, please give us as much information as possible so we can be ready to help you out when you arrive.